Even if he says he is very happy with his bachelor lifestyle, he might do things to suggest that he would love to put a ring on your finger. It is possible that he does not have the intentions now but he would do things, unknowingly of course, that you can take as signs he wants to marry you in the future. Here are some of the most common signs showing that he has an emotional attachment with you and may give your relation a new name some day. It shows that he trusts you and values your opinion. It does not always have to be about you either. Even if he talks about his future job prospects or setting some money aside to enjoy a European vacation one day, this still shows that he is committed. He may also ask you about your opinion on things like what type of job you would prefer or which part of the country you would to choose settle. Know that he is really thinking about future with you if he notices that there is a degree of compatibility in your lifestyles and life goals. This is another sign that he is taking this relationship seriously. You will actually be a part of his family once you get married to him, and if he has already introduced you to his mother, that is one of the signs he wants to marry you someday. This is more likely to be the case if you enjoy a good relationship with his family as well. Moreover, he may not just introduce you to his family but he may also appreciate you in some way in front of his family members. You may also want to pay attention to what kind of values and culture his family and close friends have. How many of his siblings are married and where do they live? Do you think his family is quite religious, especially when it comes to marriage? Considering all this will help you find an answer to where he wants your relationship to go from here. This is yet another sign that both of you are more than just good friends. If his family goes on vacation and invites you to join, this shows that your relationship is probably heading toward marriage. The thing is that you two are considered so close to each other that even your families do not mind including you in important events. In fact, you may be invited to every occasion, and this actually confirms that he takes you as part of the big picture of his life. Have you noticed him spending more time with you in the recent months? Well, an increase touch may indicate that he admires you and wants to be around you all the time. Moreover, there may be an increase in physical touch as well. You may notice him touching your arm while you are working or caressing your neck when you are cooking. These are all signs that he wants this relationship to go ahead from here. Another one of the signs he wants to marry you is that he calls you a permanent member of his 'team' in the workplace. This is especially true when he does not mind talking about his work problems with you and even decides to celebrate his successes with you. It shows that he values your influence in his life. One of the major barriers in most relationships is a woman not understanding the experiences of a man at work, but if that does not apply to your case, your relationship is certainly heading toward marriage. If he makes plans with you and does everything to keep his promises, this shows that he wants to be around you and misses you all the time. Your relationship is never going to work with someone who makes plans and then calls to break plans, as it shows that you are not the center of attention in his life. Again, if that does not apply to your case, it shows his commitment and confirms that he wants to marry you someday. If he opens up to you and shares everything on his mind, know that he really wants to marry you. This is a great sign that he values what you have to say about different things, and he may actually change his decisions after discussing things with you. This shows a good level of closeness and indicates that your relationship is already on the path to marriage. 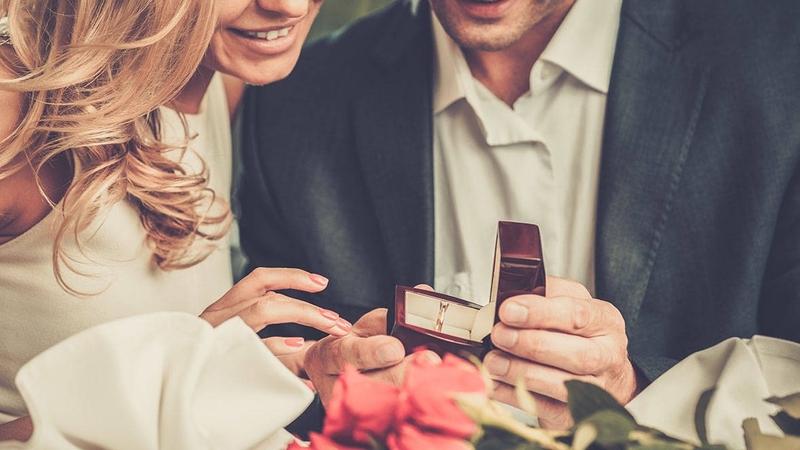 Looking for signs he wants to marry you? See if he’s always around supporting you. It shows that he is very committed and is not someone who is around to have fun with you only. If he is there during the hard times and supports you when the things are not going your way, chances are he will also be there with you on your wedding day. Even though you know he is not serious, it still shows that he takes you as a good life partner. Therefore, do not ignore those jokes about you two getting married, having kids, and growing old together. He may have already chosen you as a life partner and making these jokes to know your reaction to the idea. Whatever the case, these jokes will always have a potential to turn into reality. What it means is that even though you two are not married yet, he still cares for you and even does not mind taking decisions on your behalf. Of course, you two may not be in bed together yet, but he may be very protective towards you, just like a good husband. If it feels like he behaves as if he is your husband, expect that proposal coming your way in the near future.